Are you someone who likes to explore every chance you get? Then you need a vehicle that can keep up with your adventurous spirit! The Jeep Wrangler is there to take you on any adventure that you could imagine. The 2019 Wrangler is the most capable model yet with available 33-inch tires, stronger axle tubes, larger brakes, three available 4x4 systems, rugged steel skid plates and more. Not only does the 2019 Jeep Wrangler have these improvements, but it also has the latest technology and features to keep you comfortable and connected the next time you go exploring. Continue reading to learn about some of the other highlights that the 2019 Jeep Wrangler has to offer or click on the button below to view our current Wrangler inventory! Drivers of the 2019 Wrangler will have the choice between five different trim levels – Sport, Sport S, Sahara, Rubicon and Moab™. Each of these models of these of the Wrangler has their own unique look and style while also packing a different set of features. With these different options, drivers are more likely to find a model that fits both their needs and their budget. Drivers will also have the choice between ten different exterior colors. We all know the Jeep Wrangler is capable of exploring off-road, but what can it provide to you inside? With the fourth-generation Uconnect® system, everything you need is right at the tips of your fingertips on the touchscreen display. The available navigation system can clearly be displayed on the customizable gauge cluster so that you can easily find your hidden trails and hideaways. This is only the beginning of what the 2019 Jeep Wrangler has to offer. 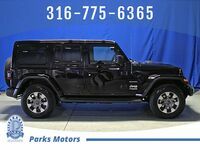 If you are interested in the Jeep Wrangler or any of our other inventory, be sure to click on the button below to receive more information!